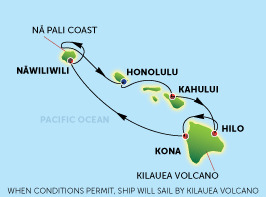 Hilo, Hawaii – Gaze up from this charming town and see snow-capped Mauna Kea volcano. It’s just one of the scenic marvels in this exotic greenhouse of lush tropical plants, towering banyan trees, thundering falls and enough flowers to fill a rainbow. Arid deserts, steaming fissures and volcanoes that blow their tops are just as impressive. Honolulu, Oahu, Hawaii – Combine the languid allure of the tropics with big-city sophistication, then add the spirit of aloha, and you’ve got Honolulu. This Pacific crossroads features museums, dazzling beaches, historic Pearl Harbor and spectacular sunrises over Diamond Head. Gardenias and jasmine blanket the air with a heady fragrance, and pink sunsets cast a magical glow over fabled Waikiki Beach. Kahului, Maui – A surplus of natural splendor and the genuine hospitality of its people have helped to make Maui Hawaii’s second most popular island. Explore the fascinating history of the town of Lahaina. Plant yourself on a pristine beach, or play one of the world’s most beautiful golf courses. Kona, Hawaii – The sun-blessed Kona coast stretches 80 miles along macadamia nut orchards, famous coffee plantations and some of the most important sites in Hawaiian history. The coast is famous for water sports, and the Hawaiian International Billfish Tournament is a world-renowned annual event. Nawiliwili, Kauai, Hawaii – The Garden Isle, Kauai receives the most rainfall of all the Hawaiian Islands, which leads to lush vegetation and elegant hibiscus blossoms, as well as a huge canyon carved by wind and water erosion. Marvel at the narrow paths worn by the ancient Menehunes into the cliffsides of the steep Na Pali Coast, unmarred by roads and unapproachable except by foot trail or helicopter.